I grew up in Southern Manitoba in a Mennonite community where we were taught to follow a set of rules. It was like the 10 Commandments grew. Thou shalt not dance, Thou shalt not smoke, thou shalt not drink, thou shalt not go to the movie theatre, thou shalt not play billiards, etc. etc. When you are given rules to live by, from your parents and/or church, you do one of two things, obey them or break them. You might try to challenge them or even argue them, but then you still opt for one of the two options. However, we were also subconsciously taught to just obey them and never to challenge them. Then something unheard of happened, Billy Graham made a movie for the theatres. Now what? A moral dilemma. Billy Graham is good, movies are bad. That was only the beginning of the rules falling apart. School dances happened, billiard tables were brought into homes, etc. etc. Society grew, changed, advanced and rules got broken. For the most part we were not taught to understand the why's of the rules but were told not to challenge them. We were rarely taught to think critically and to develop a critical mind, whereby we could, in any given situation, be able to decide for ourselves if something was right or wrong. We were also not taught how to live amongst those who did all the above things; those who lived outside of our rules. How can we be salt and light to those outside our faith if we ostracise ourselves from them, and live in a bubble? How can we live in that world and be a light? Can we? Should we? Must we partake to fit in? Can we befriend those who do things outside of what our conscience says is permissible? We need to begin to teach our children, and our young people, how to live in the world; outside of the protection of the ‘bubble’. We need to learn to love those who live differently than we do. Inviting people to church makes us feel 'safe' and comfortable, because that’s our turf, but how does the other person feel? We need to teach the church how to enter into the world and love them in THEIR environment. 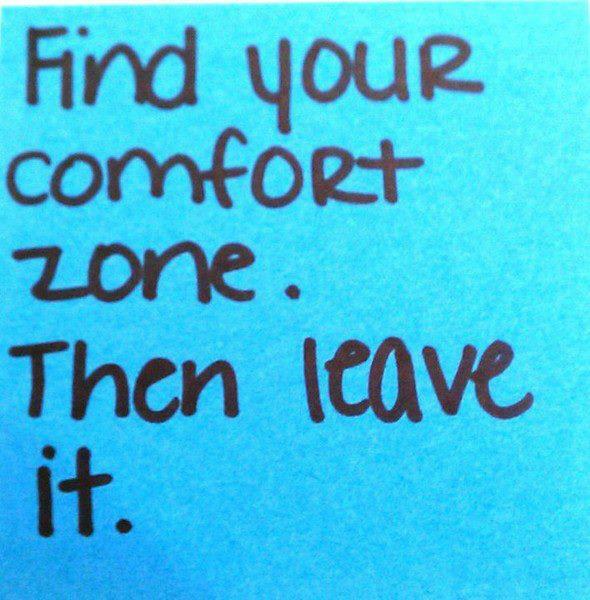 We need to learn to be okay with feeling uncomfortable in an environment but comfortable in who we are. We need to love someone enough to live in their world, and try to enjoy their world. There is a risk involved. 1 Corinthians 10:11-13 reminds us of exactly this: “…So, if you think you are standing firm, be careful that you don't fall." There are temptations in the world (actually temptations also exist in the bubble), but the One inside of us is capable of carrying us through whatever He calls us to. Living ‘in the world but not off the world’ means being okay with constant tension. There is little tension if you stay complacently in the bubble. There is little tension if you capitulate completely to the ways of the world. Living in the world, and loving others outside of the bubble, will inevitably produce tension, feelings of being out of your comfort zone, and likely some uneasiness. We will need to teach ourselves to be okay with this and to be able to handle it. One of the things I have been challenged on is that I need to do this daily. If I love someone, I need to not put conditions on that love. I will enter their world, I will step outside of my comfort zone to love them. I will put no expectations on that love. I will pray that they see that the thing about me that they are drawn to is Christ within me. I will pray that I will be able to share Christ with them but I will love them even if they reject Him or chose to live otherwise. I will not judge them by my rules, I will love them. 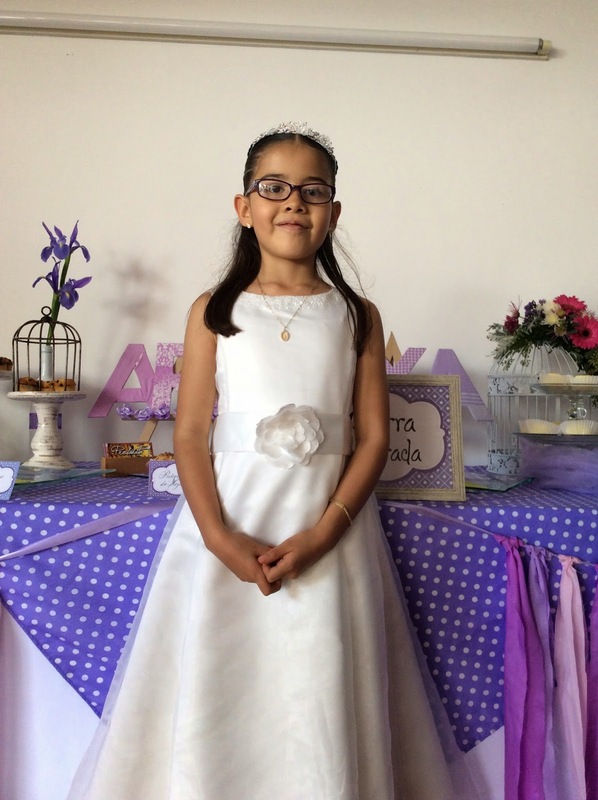 On the 8th of November we were invited to attend a First Communion of our friends, Flavio & Hilda's daughter (pictured above). This begins with mass at a parish followed by a celebration with family and friends. 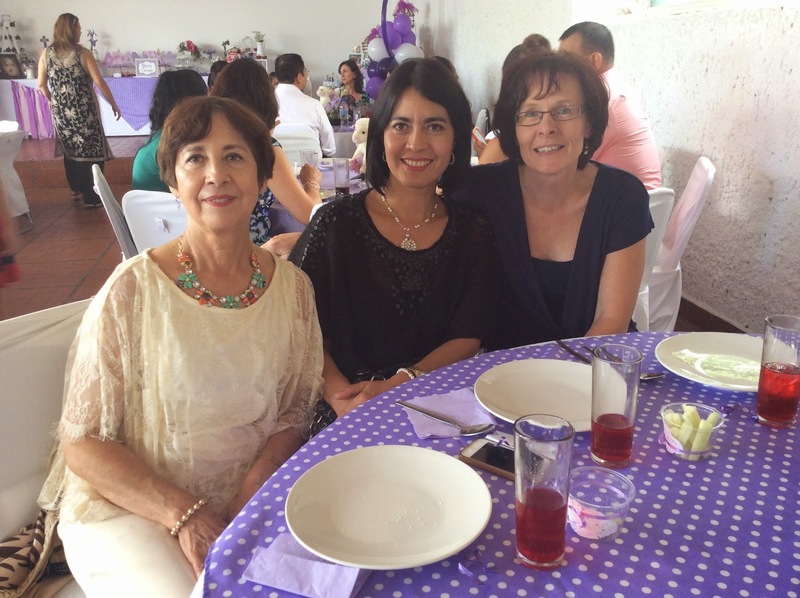 We decided to attend the mass, as another learning experience, rather than just attend the party, which many did. We were fortunate enough to sit by my friend Diana from the gym, who was willing to explain if we had questions. Diana, (my friend's mother) Diana and Diane!! "First Communion is considered one of the holiest and most important occasions in a Roman Catholic person's life. It is the first time that a person receives the Sacrament of the Holy Eucharist, which is the eating of consecrated bread and drinking of consecrated wine. Catholics believe these to be the body and blood of Jesus Christ. Most Catholic children receive their First Communion when they're 7 or 8 years old, because this is considered the age of reason. Other people can receive communion for the first time whenever they've met all of the Catholic Church's requirements." You can go to the 'Wise Geek' link for more information. For us it was a learning experience and we were glad for Diana's help. One of the things that I think the Catholic Church does well is educate or train their children in their faith and from a very young age. However, they struggle with similar challenges that we do as Evangelicals. It needs work on an individual level so that it doesn't stay as head knowledge, or ritual, but becomes a personal, applied, and lived out faith. We hope to model that kind of relationship with Jesus and relationship between our faith and our daily lives. So, together we enjoyed a good meal and much laughter. Our friends from the gym are fast becoming some of the most important people in our lives. We enjoy our times with them, they continue to invite us so we continue to go. We respect their faith, although different from ours, and they know that we are Evangelicals. Through respect and dialogue we believe both sides can learn from each other. Over the last few weeks the news here in Mexico has been such that one does not want to actually listen to it. However, one can hardly ignore it. It flashes across the T.V. news, the radio, is posted on FaceBook and is talked about over drinks. I am not sure if you hear about the things happening here but Mexico is in deep need of many prayers. It is so dark that many are saying PRAY PRAY. A message was sent to my phone by more than one group asking that I set my phone alarm for 8 p.m. every night to remind me to take a moment to pray. My alarm goes off nightly. What am I to pray for? The situations that are ongoing. The biggest issue getting the most press is the disappearance of 43 students in Ayotzinapa, Mexico. But this might just be the event that has lit the fuse. Ongoing kidnappings, assassinations, and widespread corruption seem to have brought things to a boiling point. Accusations abound, demonstrations are rife with emotions, and parents are begging for answers to their missing children. The violence is everywhere and people are afraid and unsure where the answers lie. But the Catholic church called its people to prayer, Evangelicals are praying, only God can bring peace. So, we ask you to join us in praying for Mexico and about the unrest that is ongoing, creating fear amongst her people. Join me at 8 p.m. every night or just add this request to your daily prayers. I know that Thanksgiving has come and gone, but I just can't help but have a thankful heart. God has blessed us abundantly. If I were to make a list of pros and cons in my life ledger, I am not sure the cons would be worth noting. Sure, I miss my kids (all three of them) tremendously, but I can literally talk to them almost anytime, and SEE them. I sometimes miss the ease of living in my own country but again the pros for living here outweigh the cons (hate to rub it in but 25 degrees on the plus side, verses heading to the minus side of the equation - well enough said!). The thing that I am most thankful for is the people God has placed in our lives. What rich friendships we are developing. We have a wonderful family of believers through John & Connie's cell and Dallas and Tara's. Such awesome people. We love each encounter with them. Then there are our neighbours, people to stop and chat with, people to get advice from, borrow something from, and just the wonderful camaraderie. I can feel safe even when Ernie is away. Then there is our other family, our special family of friends at the gym. What a blessing. 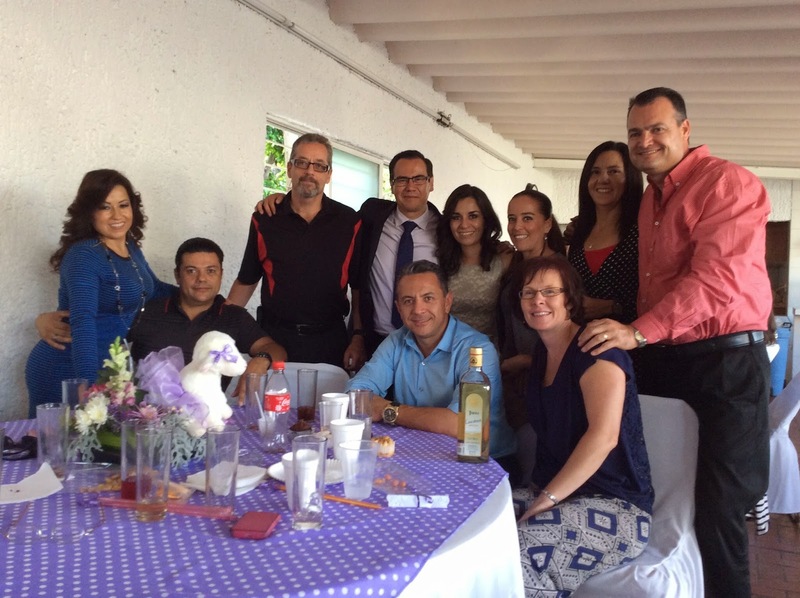 These are people to go for breakfast with, out for an event, get information on whatever, help in our adjustment to Guadalajara, people to laugh with and celebrate life. Diego - Go Chivas Go! We spent Sunday morning at the soccer pitch. Diego is the son of a friend from the gym, a single mother. Her oldest son is in the hospital after a traffic accident (please pray for his recovery). Not quite hockey, but another piece of the culture to appreciate. Above are pictured our hosts for a Halloween party. Saturday night we headed to a karaoke bar where we enjoyed a night of singing (somewhat badly, I might add), eating and laughing. This is another couple from the gym. Our weekend ended with a wonderful lunch with a view - a restaurant on the edge of the canyon. I had asked one of the guys (Luis) at the gym about a place I had heard about here in Guadalajara (this was done of course while we were on the elliptical machines, working hard). Well, it was not long after that that he had an event planned so we could "conocer" (get to know) the beautiful place. They are so willing to have us see their city and know their country. It was a perfect day with some of the great friends that God has blessed us with.